Kia has sold 28,815 Venga minivans in Europe in the first 10 months, according to market researcher JATO Dynamics. SEOUL (Bloomberg) -- Kia Motors Corp., South Korea's second-biggest carmaker, increased its global sales outlook to a record 2.1 million vehicles this year as models such as the Venga small minivan and Sportage SUV in Europe see strong demand. Unit sales will jump 37 percent from the previous year's 1.5 million, the previous high, the Seoul-based company said in an e-mailed statement. The company earlier this year forecast 2010 sales at 1.94 million vehicles. Kia has lured drivers this year with the new Venga and updated Sportage in Europe and revamped Sorento SUV in the United States. 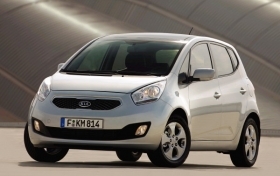 Through 11 months, Kia's European new-car sales are up 4 percent to 241,658, according to industry association ACEA. The carmaker has won market share in the United States on rising demand for vehicles that sell for about $8,000 less than the industry average. Kia rose 0.6 percent to 51,600 won at the 3 p.m. close of trading in Seoul, while the benchmark Kospi index gained 0.4 percent.